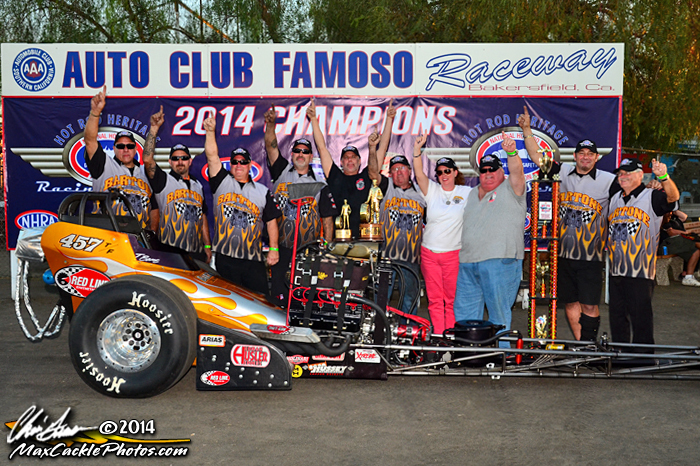 October 20, 2014, AA/FD HQ—For Long Island City’s Tony “T-Bone” Bartone, 2014 ended as it began: At Famoso Raceway north of Bakersfield, and with a no-quarter, relentless bombardment that annihilated the competition and left no survivors. 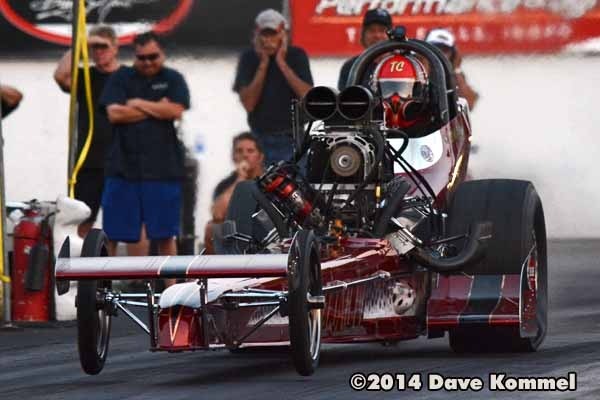 At Sunday’s California Hot Rod Reunion, Bartone, the 2014 NHRA Heritage Series Top Fuel Champion, drove through the field with the subtlety of a drone attack and claimed his fifth consecutive event win, as well as once again earning both Top Speed and Low Elapsed Time honors. 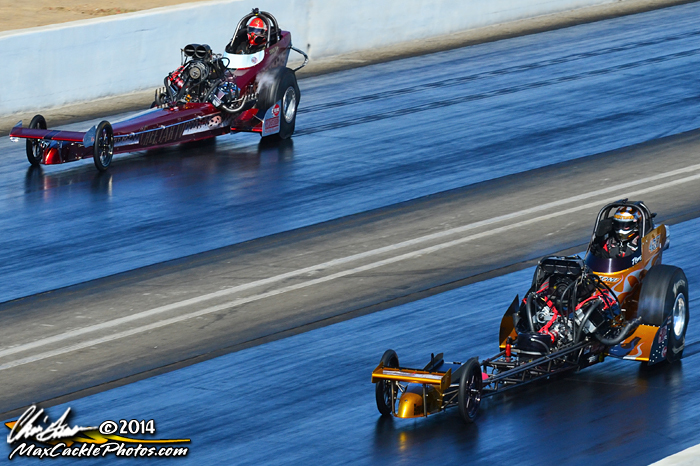 The Reunion’s final round of eliminations featured Bartone and San Diego’s Rick White, the same two drivers who fought it out at the season opening Bakersfield March Meet. On Sunday’s match, an anxious White fouled away any chance of stopping his New York nemesis, and the default win for Bartone meant that he ended the season undefeated. Yes, after five consecutive event wins and ten consecutive superior performance marks the Steve Boggs-tuned “Bartone Bros.” AA/Fueler was perfect for the entire year. This is utterly unprecedented in Heritage Series-style drag racing competition. Racers and race fans who watched the event unfold knew that history was being made. Among those who got the closest view was Sacramento-based driver Terry Cox, whose “Cheetah IV” dragster was Bartone’s second round victim. Cox cut a quick light, but by half-track Bartone began to drive around him. At the finish line, Bartone’s scored a ¼-mile elapsed time of 5.63 seconds and a top-end speed of 237 mph. Cox clocked in second-best at 5.96 seconds. In the semi-finals, Bartone squared off against Midwestern-based Jim Young, an aggressive and tenacious racer who had already secured second place in the 2014 Heritage Series Points Race. Like Cox, Young also left Bartone behind when the start lights flashed green, but his initial advantage was eventually overcome by the fierce half-track and top-end charge of Bartone’s Boggs-powered dragster. Young posted a respectable time of 5.76 at 247 mph, but Bartone turned a better 5.64 at a top-speed setting 256 mph. This led to the final between Bartone and White. Earlier White had posted numbers of 5.68 at 254 mph, a performance powerful enough to give local supporters hope that, with some minor tweaking, the Neal & White entry would have enough to upend the Bartone juggernaut. These thoughts went for naught as soon as White red-lighted, however. Despite his starting-line foul, White blazed down the dragstrip in vain and never received an official time. Bartone, meanwhile, gingerly posted his slowest times of the weekend, and took the Reunion win with a clocking of 5.86 at 212 mph. October 15, 2014, AA/FD HQ—Despite having their buttocks handed to them all year by an East Coast interloper, California-based Top Fuel teams will endeavor to save face and salvage their season. 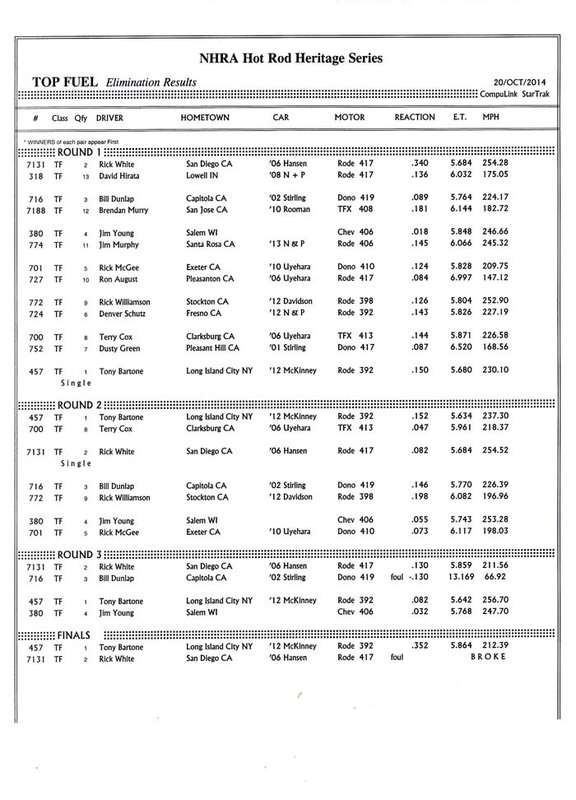 They have one race remaining on the 2014 NHRA Heritage Series schedule that they can use as a means for revenge: this weekend’s California Hot Rod Reunion at Famoso Raceway, north of Bakersfield. Their target: Tony Bartone. By virtue of sweeping all four Heritage Series events so far, New York-based dragster driver Tony Bartone has earned the NHRA Heritage Series Title. That much is settled, as is 2nd place, a position claimed by Wisconsin resident, Jim Young, who has netted runner-up results in three races already. What is up for grabs is the Reunion Event win laurels, and the California crowd maintains it is theirs, almost as birthright. The East Coast? The Midwest? New York? Wisconsin? Those states could be on another planet as far as the West Coast-centric AA/Fuel Dragster scene is concerned. Among the California dragster drivers who have the best shot of not only upending Bartone’s undefeated streak are racers like Adam Sorokin in the explosive Chevy-powered “Champion Speed Shop” entry, Jim Murphy in the always stout “WW2” dragster as well as Denver Schutz in the fierce “RE3” machine.